The CICC offers a certification and the Certified Rigger and Signaler (CRS) designation to those candidates who meet the ANSI Safety Requirements for Rigging Qualifications and Responsibilities in the Construction Industry and OSHA 1926 Subpart CC — Cranes and Derricks in Construction. 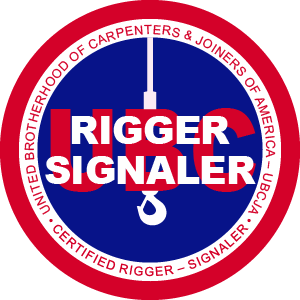 Certification holders may state that they are Certified Riggers and Signalers and may use the CRS designation to market their credentials on business cards, resumes, etc. Additionally, each CRS receives a certificate and their credentials are posted on their wallet-sized verification card. The verification card has a Quick Response (QR) code that links to a database of certification and qualification records. The certificates and electronic records contain the name, date of expiration, and the unique membership ID number of every individual who has successfully completed the CRS assessments. The purpose of the CRS program is encompassed within the mission of the CICC. The purpose of credentialing Rigging and Signaling personnel is to provide the public, contractors, and coworkers with confidence in the quality of the deliverables and the safety of the practices being employed. Develops, evaluates, updates, and administers different written examination forms to assess the knowledge and skills required to competently perform the job tasks of a rigging and signaling professional. Develops, evaluates, updates, and administers a practical examination comprised of job simulation activities that imitate real-world rigging and signaling situations. Click here to view the CRS Candidate Information Brochure. Click here to view the CRS Exam Summary Report. To become a CRS, a candidate must be a UBC member and must successfully complete a knowledge-based written examination and a hands-on practical skills assessment. By passing these examinations, a candidate demonstrates competency in the knowledge and skills required to perform safely and effectively as a CRS. In order to qualify to sit for the CRS assessment, a candidate must first attend at least 29 hours of training that includes both knowledge transfer and practical safe application. Course content must be designed to add to the hands-on experience gained in the field using rigging techniques and hardware. Please refer to the CRS Candidate Information Brochure for additional information on the training requirements. What is the format of the CRS written examination? Candidates are allotted three (3) hours to complete the CRS written examination. The content of the examination follows the plan (detailed below), which was derived from an in-depth practice analysis validation effort that was completed in 2016. The written examination has a total of 100 questions, which includes 20 experimental items throughout. These experimental items do not count for or against a candidate’s exam score and are included to collect information on questions that may be incorporated into future test forms. How can I request a copy of the CRS Practice Analysis Report? What does it take to pass the CRS written examination? The pass point for the CRS written test is 500, based on a scaled scoring system. To allow for consistency and ease of interpretation, candidates’ scores are changed from their raw score (i.e., number correct) to a scaled score. Specifically, the raw scores are changed to a scale that ranges from 200 to 800, where 500 is the pass point. Therefore, regardless of how the test difficulty changes over time, the way the scores are interpreted will always remain the same. That is, a score from 500 to 800 will always indicate a passing score and a score from 200 to 499 will always indicate a failing score. What is the format of the CRS practical test? All candidates should bring a hard hat, safety glasses, long pants, and work boots to the practical test. What does it take to pass the CRS practical test? The practical test includes 10 scoring units. The validated standard for the practical test is scoring a minimum score of 23 out of a possible 41 points that are captured across the two exercises noted above. Candidates who do not meet the 23 point standard in the practical test will not achieve certification. How can I prepare for the CRS written examination? The following reference list provides suggested materials that could assist you in preparing for the CRS written examination. This is not an open book examination; candidates are not allowed to bring reference materials into the test administration site. © Copyright CICC. All Rights Reserved.